"I am a radical. I want to see a lot of changes"
"I DON'T KNOW how to persuade people of my dream." 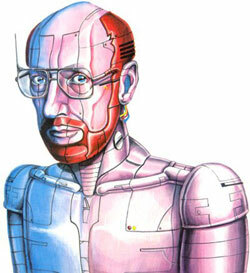 Thus laments Sir Clive Sinclair, pioneer and proponent of the Fifth Generation, the thinking machine's man. The controversy over Artificial Intelligence, previously confined to academic and scientific coteries, is now raging on television, radio and in the national press. Battle has been joined, too, in the pages of Sinclair User. Can mankind, and should mankind, take on the role of God and breathe life into a super-intelligent being? What are the consequences if man succeeds? In an attempt to put the record straight, Sir Clive talks to Sinclair User about the future he is building and in which we will be living. We start, however, with the more immediate future, and Sinclair Research's plans for 1985. Rumours of an improved QL, with ROM based software and retailing at around £500, have got the new year off to a traditional, speculative, start. Sir Clive has no intention of being pinned down: "We haven't made any such announcement." Does that mean he denies it? "No, it means nothing of the sort." Sir Clive is an old hand at these tactical exchanges; the phrasing becomes all-important. If such a machine was to appear, would upgrades be offered to owners of the old QLs, rather in the manner of the 16K Spectrum upgrades? "I've no idea ..." He considers the wisdom of that. "It must be possible to do it and ... yes, we would do it. Yes, absolutely." Unsure as to where that leaves us, we pass on to safer territory and the much-talked about portable computer, which is to include an in-built microdrive, a flat screen display and a real keyboard, and cost about £300. Sir Clive does admit to something along those lines. "It's not yet had the button pushed because we're still doing some work on the display, and until we have a display we're satisfied with we can't go ahead." Ah, the controversial flat-screen display. Haven't there been some problems with it, such as the picture being unstable? "I don't know," Sir Clive shakes his head. exasperated. "There seems to be a move around to knock our products. The flat screen display is the best in the world, in terms of 2" flat screens. Absolute wonder of technology. We haven't had a single complaint..."
Some critics have suggested, nevertheless, that perhaps a liquid crystal display ... "They must be out of their tiny minds! God! I've yet to meet anybody who thinks a liquid display is anything other than awful." But there have been production problems with the screens. "When you're building a plant that's always the case. Again, it's the bloody press trying to find something at fault. We have the most modern production plant in the world. Highly automated. Perfect tubes." It has been well over a year since the microdrives were launched and there is still only negligible software available. Sir Clive is quick to accept responsibility. "That's our fault. We haven't been able to make enough microdrive cartridges available. The plan was to get the microdrives out there and then to get the demand right up and the price right down. At the moment they are not attractive to software houses." Isn't Sinclair Research spreading them a bit thinly at present? ICL is using them, the QL does too and even the planned portable is to have a drive built in. "It's getting overwhelmed by its own success," Says Sir Clive ingenuously. "We are only holding he price up artificially to restrain he market until we can meet it." A bizarre remark, when Sir Clive acknowledges that the microdrive Expansion Pack promotion was an attempt to encourage the market to take an interest in the beasts again. It's time for the old chestnut. When will the Spectrum come down in price? "Hah! The old answer is the same. No plans to do so." Sir Clive leans forward, earnestly, "This will sound like a sales story, but it's true. This Christmas sales of micros have gone down, with one exception - sales of Spectrums are better than last year. We are oversold; we can't supply as many Spectrums as the stores want. A hell of a lot more than last year." He's right, it does sound like a sales story. What proportion of those are Spectrum Pluses? "We're shipping rather more Pluses than Spectrums. It's about 60-40." By bringing the Spectrum+ into the Commodore price range Sinclair Research has invited comparisons between the two machines, whereas before, the Spectrum had a clear advantage in price. The Commodore 64 offered features which might seem attractive to the customer - sprite graphics, enhanced sound, arguably a superior keyboard. "We wanted that to happen," says Sir Clive. "When you compare the machines the Spectrum is actually the more powerful. There is more available RAM." The Commodore 64 is nevertheless at the top of some charts - notably in Personal Computer News. "That's completely false! We out-sell Commodore by two or three to one." And the QL? "We're shipping them at the rate of 25,000 a month." That would mean sales in excess of 40,000 by the end of 1984. "Something of that order." What is Sir Clive's reaction to the recent survey, which indicated that 25 percent of Spectrums sold are returned as faulty? Sir Clive explodes: "That's the Acorn dirty tricks department! Acorn did it. They hide behind ..." He gropes for suitable invective. "It was their advertising agency. They got this scruffy little outfit and all they did was to ring around some independent retailers for three days - this is the prize survey. Of course, they're biased because they were trying to get the figures they want. "The period over which they took the survey was the quiet period of the year, March to September. We don't sell many computers into the stores then but all the returns come in from the previous Christmas, so you get a completely silly and skewed result. That doesn't happen with Acorn because they haven't sold any the previous Christmas." Pausing for breath, Sir Clive continues. "We know what our returns are and we're not proud of them. We get 13 percent returned, and that is high. But over 40 percent have no faults found, and a lot of the faults are very trifling. "We are selling a lot of machines to a very young audience, bloody good at spilling Coca Cola over them and otherwise messing them up. The actual returns are nearer seven percent." He ponders. "Maybe the instruction manual could be better." An idiot's guide to plugging in a computer? "The Spectrum+ instructions are just that." Pessimists are saying that the UK home computer market is fast approaching saturation point. Manufacturers now have to break out of the hobbyist market and convince people who wouldn't normally buy a computer that it is something useful - even essential - for the home. "I think the market has peaked," Sir Clive agrees, "and will decline in terms of hobbyists. It's a feeling I've got that the time has come for serious computing." Not, then, diary programs, telephone directories, recipe planners, gardening books ... "We're all fooling ourselves if we think we're going to sell a lot of machines on that basis." The government scheme for placing computers in primary schools finishes in January. Like the secondary school scheme, it has not been considered a great success by teachers, who feel that schools suffered because of the promotion of the BBC micro, much more expensive than the Spectrum. Not surprisingly, Sir Clive concurs. "The whole BBC business was outrageous, and I'm very sad that it lost the country the coherence it might have had." The government has been strangely pleased with the scheme, claiming that the school children of today are the first generation of the computer literate. Sir Clive laughs. "I think it's a question of not being frightened of computers. It's not that we want them all to be able to program but to be able to use the machines. Realistically, a lot more has been done for computer literacy through the sales of machines to play games on than anything the schools might be able to do." At last we come to the matter of Sir Clive's speech to the US Congressional Clearing House on the Future, and the reply by Alexander Macphee in the November issue of Sinclair User. Sir Clive is not amused. "It was a silly article, outrageous really. He had misquoted what I'd said ... or misinterpreted it. He just doesn't want to believe." One point with which Macphee disagreed was the suggestion that 'our lives will parallel the lives of the Freeman of Athens.' Sir Clive shrugs, "OK, that's the difference between optimism and pessimism. I'm optimistic and I believe that can happen and he's entitled to say he doesn't, but what's the point?" There is a point. Sir Clive is in a position to shape that future and to be optimistic isn't enough, he must be confident that the consequences of his actions will be beneficial. Apparently, he is. "I speak from some knowledge. I know that technically we can make a machine as complex as the human brain. I don't know that we can make it do what a human does but I think it's very likely that we can. "If one day we can make machines with human-like intellect but free of human frailty, then in a sense we will have servants in the way that the Greeks did. We'll have the sort of intelligent beings which everyone can trust; the Russians can trust them, and the Americans too. They will be without guile. "I strongly believe we can have a better world for it. Imagine, you could put one of these wondrous creatures down in the middle of a village in India, to look after the people there, to teach them ... oh, I don't know ..." His voice tails off; perhaps he, too, is momentarily stunned by how naive and patronising that sounds. What I don't know is how to persuade people of ... my dream." He is silent again. In his speech, Sir Clive acknowledged many people would be 'unemployed and very miserable' as a result of increasing computerisation, but it would be only 'a temporary pattern'. How temporary? "I think we will have a long bitter period now - the next five years - when unemployment will remain high, and then it will decline again. People want to work ... It's not that new jobs aren't being created; they're being created faster than ever. Employment will cease to be a worry of the 90s." If that's true, then education must change dramatically from what it is now, to gear people to fill the kind of jobs vacant in the future. "Education is going to have to change very much. We've got to give children taste and we've got to teach them to be self-reliant." That couldn't be further from what is happening now. Sir Clive agrees, "I'm very worried. I was on television the other day, saying exactly the same thing." Sir Clive dismisses fears of an Orwellian society, a tyranny of machine surveillance, yet the misuse of technology is rampant today. "Absolutely. I don't mean that technology is not misused. God knows it is in Russia." Isn't it rather like inventing a gun, giving it to someone supposedly responsible, and saying 'It's loaded, just don't point it at anyone.'? "No, it isn't like a gun, it's like a car. You've got to be careful with it but it can take you all sorts of places. It's true that things can be misused and I wouldn't be talking to Congress and talking on television if I didn't think we need to prepare for it." Some of Sir Clive's wilder ideas would not be out of place in the novels of Arthur C Clarke or James Blish. Has he been influenced by science fiction? He smiles. "Yes, as a child. I still do read some but I don't have much time." Isn't he disappointed that the world of the 80s is so shabby compared to what it should have been like? "I know, but on the other hand ..." - A long pause, while he tries to locate the other hand. He sighs. "Yes, it is rather disappointing. We've all got televisions and what have we got to watch but a lot of rubbish." And we've all got computers and we're playing Jet Set Willy. Sir Clive thinks again. "It's disappointing so far but it's getting better ... Average people can travel to the continent or the States, things which they could only dream about before." What about the Third World, the famine in Africa? What price progress? "So many governments don't look after their own people; they misgovern to such an extent. It is depressing because some things are done so well. The eradication of smallpox - an unbelievable achievement. India now feeds herself. China is an exporter of food. There are appalling slips back in Africa and South America but it is not all loss." "I believe very, very, strongly in free enterprise at a small level. I also believe very strongly in the need for a major overhaul in a lot of our institutions ..."
Sir Clive warms to his subject. "Why do we need three separate forces? It's quite barmy. And what do we need them for in the first place? Are we going to fight more wars? I hope not. All you need is a bigger police force which can be turned to the defence of the nation in emergencies. So, I'm a radical. I want to see a lot of changes. "Mankind does act selfishly, but that doesn't mean there isn't altruism in people. Things will work out best if they're allowed to. That is a kind of conservative viewpoint - an Adam Smith viewpoint. I don't believe you'll get a worthwhile society if you plan altruism into it. I believe in libertarianism. "I wouldn't say I was right wing, but I'm certainly not very left wing either. Middle of the road in most things, but very radical. I'm very dissatisfied with British society as it is today. " The father of home computing in this country, and the father-to-be of the next generation of machine marvels, shakes hands and the interview is over. Mad scientist or industrial revolutionary, entrepreneur or prophet, Sir Clive Sinclair is pressing on regardless, building brave new worlds and carving a niche for himself in the history books. Only the future will tell us whether his endeavours are misplaced. By then, of course, it will be too late.